The third and final day of the PokerStars.net Asia Pacific Poker Tour at the City of Dreams — a tournament that attracted 585 entrants and created a prize pool of ₱25,535,250 (USD $558,000) — saw 23 hopefuls return to the tables with Iona Finkenrath in the lead, while Aaron Lim was the only former APPT champion still in, having taken down APPT7 Seoul in March 2013. Nearly 12 hours later, Finkenrath was gone, and Lim emerged victorious in heads-up play against Day 1a chip leader Douglas Olsson for a payday of PHP 6,016,250 (USD $131,271.51). 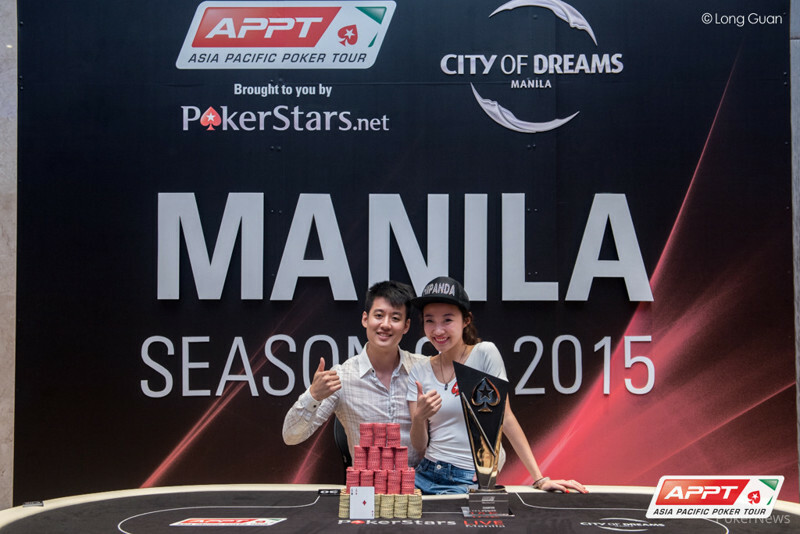 Not only that, Lim also received a HK$ 100,000 entry to the 2015 ACOP Main Event and became the APPT's first two-time champion for taking down the biggest international poker tournament ever held in the Philippines. "I feel relieved," the 29-year-old Lim said after his victory. "The days were very long and everyone on the final table played very well." In the first level of Day 3, three players busted in quick succession. Nicandro Filart had his pocket aces cracked, and the same applied for Jiaxiu Wang's pocket tens shortly thereafter. Terry Gonzaga was out the door next, and the last two tables were reached with the eliminations of Andrei Dementev and Hao Tian. Hayato Kitajima jumped into the lead when Mitan Chandihok's bluff failed, and the short stacks Kazuhiro Shirasawa, Frederick Hernandez, Mike Kim and Ashley Tay all failed to survive crucial all ins for a comeback. Seung Soo Jeon was flirting with the chip lead in the first three levels of the day but Finkenrath got the best of him before the Korean lost almost all of his chips to Lim before busting one hand later. Within a matter of minutes, Xiao Tian Yang and Romit Advani hit the rail to set up the official final table with Kitajima still in the lead. 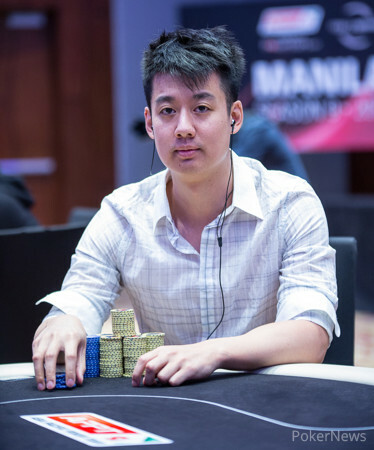 Thomas Lee caught a heater and doubled up twice in a short time before knocking out Ying Lin Chua in ninth place, catching a bluff attempt of the Malaysian. Poker King Club President Winfred Yu busted with a short stack in a three-way all in and had to settle for eighth place. The next two eliminations were somewhat of a surprise, as Finkenrath started the day with the lead and Kitajima held the most chips when the final table started. However, the German was card dead and could not stop bleeding. Finkenrath's last chips went in preflop with the but Olsson's made a runner runner straight to send the German to the rail in seventh place. Meanwhile, Kitajima's run came to an end in sixth place after running his pocket eights into the pocket kings of local hero Jessie Leonarez. Lee was dominating the action with five players left until Lim doubled through him. The Canadian never recovered from that hit and lost a lot of chips in another hand against the eventual winner when Lim flopped a set of aces on a paired board. Pocket aces became Lee's nemesis when he pushed the short stack in with the and Leonarez woke up with the best starting hand in poker. Not long after, Terry Fan finished fourth after losing a flip against the pocket sevens of Olsson, who locked up the hand on the turn with quads. Down to the last three players, Leonarez upped the aggression in order to run up the shortest stack, while Lim lost the lead to Olsson. Lim bounced back by doubling through the Swede, and then Leonarez got it in with the against Lim's pocket tens, which flopped a set. The turn locked up the hand for Lim, and he busted Leonarez in third place to take a big lead into heads-up play. 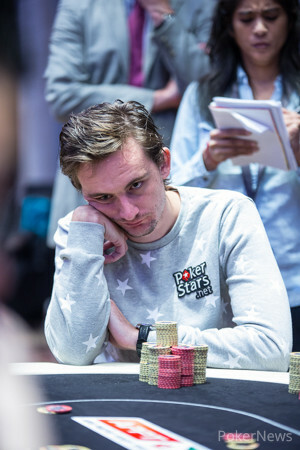 However, Olsson managed to take over the lead without an all-in showdown, but he was left very short after a massive pot where Lim flopped yet another set. After being down to only 6.5 big blinds, the Swede doubled up twice but eventually he was stopped in his tracks and felled in second place. On a board, Olsson check-raised all in with the and Lim called with the . The river was a blank and that was all she wrote for Olsson. Similar to the European Poker Tour with Vicky Coren, PokerStars' pendant in Asia now has their first two-time champion in Lim. Finally, it's worth noting that KC Wong's fourth-place finish in the High Roller event — and single-season record 13th final table — was enough to leapfrog Yuguang Li for the No. 1 spot on the Asia Player of the Year rankings. The APPT will next be at PokerStars LIVE Macau at City of Dreams for the Macau Poker Cup from August 27th through September 13th. Thanks for tuning into the PokerNews live reporting and a good night from Manila! Aaron Lim made it 240,000 and Douglas Olsson made the call. The flop came and after Olsson checked, Lim made it 260,000. Olsson made the call and the turn was the . Olsson checked again, but when Lim bet 480,000, he pushed all in. Lim made the call with and was ahead against Olsson's , but the Swede had a ton of outs to a flush, two pair, trips and a gutshot straight. The dealer then burned and turned over the river and it was all over. 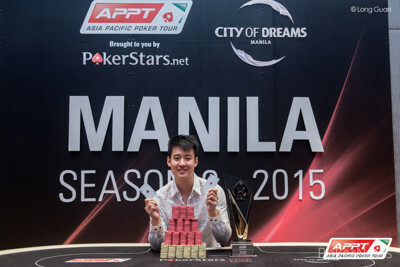 Olsson missed and was eliminated in second place, handing Lim his second APPT title and Filipino poker glory. In the first seven hands after the big clash, Aaron Lim shoved four times, Douglas Olsson once and then there were one fold by each player out of the small blind. Hand number eight post-apocalypse, Olsson moved all in for 785,000 (6.5 big blinds) with the and Lim called with . The board ran out and Olsson doubled up. Two more hands were raised and won by Lim. Then Olsson three-bet shoved for 11 big blinds and Lim called. The Swede was asking for a flop of , but the dealer burned and turned the . "Just a nine is fine," Yaxi Zhu said on the rail, though the turn was perfectly fine as well for Lim. The whole rail exploded when the magical fell on the river, only Lim showed no emotions of shock. Douglas Olsson limped the button and Aaron Lim made it 285,000. Olsson asked for a count, then announced he was all in. Lim made the call for his tournament life and a massive pot holding . Olsson was on . The board rolled out leaving Olsson drawing dead by the turn and suddenly and decisively, Lim had moved back into the chip lead. A few small pots were traded and Douglas Olsson had recently raised for 300,000 more when Aaron Lim limped. Now the Australian returned the favor and made it another 275,000 to go, Olsson called. On the flop, Lim continued for 250,000 and picked up a call before checking the on the turn. Olsson now fired 500,000 and received the call before the river was checked to the Swede. Olsson's final bet was a big one: 2 million. Lim was in the think tank and stared at his opponent and the board. "How crazy are you? You must be really crazy. Like a Scandinavian. .... You really expect me to fold an ace?!" That were just some of the quotes from Lim before he finally elected to fold. His inquiry whether or not it was a good fold didn't receive any answer. Douglas Olsson raised it up to 225,000 and Aaron Lim made the call. The flop came and Lim led for 270,000. Olsson called and the turn brought the and another Lim lead, this time for 440,000. The river was the and Lim fired again, making it 630,000. Olsson called and when Lim showed for two pair, he rolled over for the turned straight. Lim still leads, but Olsson has climbed up much closer now. There was under a minute left on the currrent level and both players have taken their seats again with a commanding lead for Aaron Lim.